Neptune™ Flotation Pipe Floats - Heavy duty solid wall molded floats prevents punctures and eliminates the need for foam - JGB Enterprises, Inc.
Olmsted Lock & Dam Project. the Neptune™ Float compress and add friction to the dredge pipeline ensuring no slippage. solution to this common issue. Tapered Ends on the outside of the Pipe Float decrease water and wind resistance. Tapered ends on the inside of float allow the pipeline to move freely. Alternate Neptune™ Floats with a Safety Whip Flag for improved daytime visibility. Heavy duty solid wall molded floats prevents punctures and eliminates the need for foam. 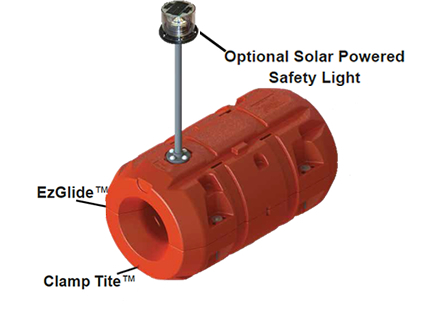 Clamp Tite™ - This optional feature compresses and adds friction to the pipeline preventing slippage. Neptune Flotation is proud to be the only supplier that has offered a solution to this common issue. Stack-N-Lock™ - This feature solves common storage and transporting problems. Built in legs on the bottom of the float and molded-in recesses on the top of float allow for easy loading & unloading of containers & trucks using fork or hand trucks. Manual loading is no longer required. EzGlide - Tapered Ends on the outside of the Pipe Float decrease water and wind resistance. Tapered ends on the inside of float allow the pipeline to move freely.